I am so happy to start my Monday with the news that one of my project is featured on Ava until next Monday, a site where designers can interact and connect with potential clients anywhere in the world without having to travel. Ava’s site is a place where anyone looking for home solutions can find it there and learn from the experts. Every week AvaLiving has a theme and based on that it features the best submitted designs. 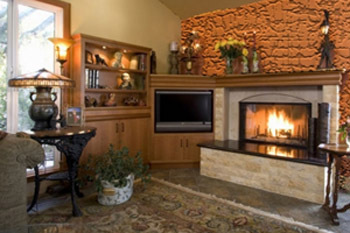 This week theme is: Hot Fireplaces. I presented my project in Foster City, California of an interested fireplace in the living room with attached built-in unit. This room was part of the entire home remodeling. Clients had no preconceived idea of any style, or decor. They were open to any suggestions. The only request was that the T.V. would not be on top of the mantel, as it is usually seen in most homes. 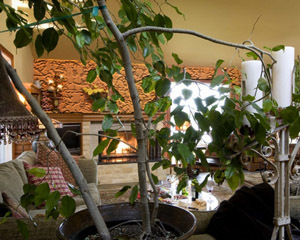 A fireplace is for enjoying fire, while reading a good book, or sipping wines in company of friends. A crackling fire should be a cozy background for watching T.V. In designing this fireplace I had a few challenges: two windows on both sides of the fireplace and not enough clean walls to place a larger plasma T.V. as the client requested. The result of my studies of the room was to design a built-in unit attached to the mantel to make it visually looking as one continuous wall. The built-in unit would include a short bookcase, a smaller plasma T.V., storage for DVD/CDs and the fireplace itself. The fireplace’s stones came from the work done in other areas of the house. Being budget conscious I make sure no material goes to waste, as usual in all my projects. The iron stone was very expensive, it was a good thinking to use the left over for the hearth application. As the professional who is always ready, I shall be prompt and ready to help you with any of your design needs, whether it will be decorating, designing, or remodeling.